More than 500,000 errors are made in the treatment and care of NHS patients each year, a health watchdog says. While most do not harm the patients, the National Patient Safety Agency (NPSA) estimated 840 of the mistakes had contributed to deaths. The rate of GP-care mistakes is less clear, but 6.5% of hospital admissions are due to adverse drug reactions. NPSA said the figures were concerning, but added the NHS successfully treats more than 1m people each day. 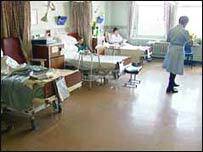 Patient falls, medication mistakes and inaccurate record keeping are the most common causes of the 572,000 patient safety lapses among the millions of people admitted to hospital, the agency's first report of NHS errors showed. The figures were compiled from the 85,342 errors - defined as unexpected or unintended outcomes - reported to the agency by just over a third of trusts from November 2003 and March this year. The overwhelming were from hospitals, although GP-related incidents showed lapses were being made with medication- particularly painkillers and blood thinning drugs such as anticoagulants - diagnosis and treatment. The situation in primary care should become clearer as more incidents are reported to the agency. The figure of 840 hospital deaths was much lower than previous estimates, although officials from the patient safety watchdog said much uncertainty remained over the extent to which patient safety incidents contributed to every case of serious harm and death. Report co-author Professor Richard Thomson said: "Every death is a tragedy for the patient, their family and, indeed, for the staff involved. "When things go wrong it is usually as a result of a problem in the system within which staff work." And he added the research would allow improved procedures to be implemented to reduce the risk to patients. The NPSA can issue guidance to NHS organisations under the patient safety alert system to tighten procedures. Peter Walsh, chief executive of Action Against Medical Accidents, said the figures were "alarmingly high". And while he admitted it was encouraging that more trusts were reporting errors to the agency, which was only set up four years ago, many were still not disclosing lapses. Chief Medical Officer Sir Liam Donaldson, who earlier this week warned NHS trusts were too slow to act on patient safety alerts, said: "We must ensure that when patients are harmed, sources of risk are identified, solutions are implemented and lessons are learned." Dr Gill Morgan, chief executive of the NHS Confederation, which represents health service managers, said for most patients treatment went smoothly. But she added: "The report is certainly no cause for complacency especially since, as this new system for reporting incidents becomes routine and more incidents are reported, we would expect the headline figures of patient safety incidents to increase."